Beef Pares is a popular Pinoy dish. It's a stew made with beef cutlets cooked in sweet soy sauce and anise. "Pares" means "pair" in Tagalog and this viand is paired with a bowl of soup and served with rice. 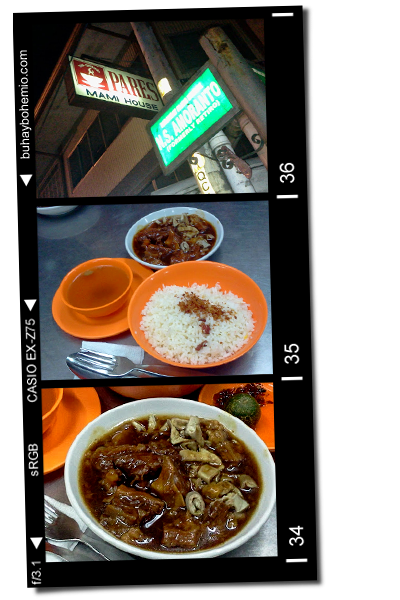 Road trippin' with peers late at night brought us to a 24-hour roadside eatery known for their beef pares. In Quezon City, at the corner of Retiro and Alejos streets is The Original Pares Mami House. It is said that this is where the recipe originated. By the taste of their pares I rather believe it is true. This is so far the best that I've tried. Even the soup is tasty. No wonder why people would wait outside for their turn to sit and eat, even at 2:00 in the morning.